No processed foods, no soy, no cruel foods. Its hard and I’m not even giving up as much as most people do. I’m eating without dairy. My body is so much healthier! 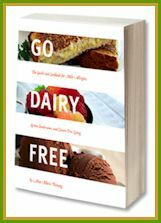 I will continue to be dairy free and would LOVE to have more information/ideas from your Go Dairy Free book. I don’t twitter or facebook but sent your url to a friend. Gluten and Dairy free here brand new to it..
oo and finally I shared and linked this on FB. “liked” Go Dairy Free” on FB. Soy- and dairy-free, might start gluten-free as well. My 1 year old daughter is Lactose and egg free. I am gluten and dairy free for a year and a half. Thanks for the giveaway! I “liked” Go Dairy Free on FB. My girlfriend’s doctor told her to try going dairy-free to see if it would help her migraines. 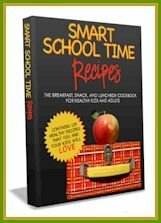 As the main cook of the household, I’m at a loss for what to make her and would really appreciate having a new book to help. By the way, I love your website, it’s been a great help! I also “liked” Go Dairy Free on Facebook! 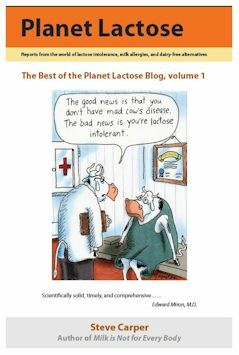 I liked Go Dairy Free on Facebook! Free from processed foods and high fructose corn syrup! Woot woot! 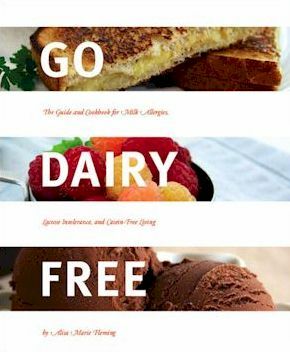 I just became a fan in Go Dairy Free in Facebook. I am a vegan, and therefore free of animals! I also try to eat mostly whole foods, though I sometimes fall victim to convenience and eat a veggie burger or frozen vegan dinner. My father is severely lactose intolerant, and I’d like to win these cookbooks so that I can make foods for him, too. I am vegan, GF, raw, soy light. thx for the give away, alisa! We are gluten/casein/soy free here. I actually have both books on my amazon wish list! my diet is “free-from” gluten, dairy, and squash! random allergies that came into my life in my early 20s, but i feel so much better now… although i’m always looking for new ideas! thanks for the giveaway! I just had my beautiful new baby girl-and before she was even 3 weeks old they took me off all dairy and soy foods (I am nursing her). I have been doing this for 2 weeks now and they say I will need to continue till she is at least 6 months if not longer! This is proving to be a hard transition for me-mainly because I am on a daily struggle on what to cook/eat and prepare for my family. I have been doing well but am really missing “normal” foods and these cookbooks look great! I am really feeling good but my brain wants all the old foods-so good subs is what I am in need of:) Thanks for all your hard work-this website is amazing! I am now a fan of your website on facebook! I have shared the link to your giveaway on my facebook page as well. I follow a gluten-free and dairy-free diet. Love your blogs! I shared the link to this giveaway on Facebook. I like Go Dairy Free on FB. Thanks! Hi! I blogged about your giveaway today! Thanks! I am on a fast-food-free diet and almost processed-food-free (whenever possible!) diet. However, I do try to be careful about knowing the origins of the vast majority of what I do consume, as much as and whenever I can!! I just found out this week at 27 years old that many of the problems i’ve been having my whole life are probably the result of several food allergies. However, now that I have to try an elimination diet, i’m lost as to how to begin cutting things like dairy from EVERYTHING. I wanted to buy this book, but would rather win it! Also going to ‘like it’ on fb. I am not on a free-food diet but I am a fan of foodie food and favor an organic veggie diet whenever I can! Soooo…. I want to enter for a chance to give this as a gift for my friend Jamie at “What I did Today.” Her baby is on a dairy-free diet. Thanks for hosting this awesome give-away!!! I would love to win these books because over the past year I have discovered I have food allergies to Milk Protein, Soy Protein, Eggs, Chicken, Turkey, Strawberries and Gluten. At the age of 44, I have finally discovered the source of my extreme health issues, and after eliminating the culprits from my diet for over 8 months now, I have been able to stop taking an immuno-suppressent drug for an “auto-immune disease” that I have been on for six years. My body is finally healing and I would love more recipes for my tool box! Just went Dairy Free and relying on Go Dairy Free to get me up to speed. I’m attempting to be dairy free since I believe I have lactose intolerance & possible dairy allergy. Would LOVE these books!! I have lately been experimenting with gluten-free. I’m also exploring the vegan lifestyle.